Gunfight on Gaza border as terrorist opens fire on Israeli forces. Terrorist eliminated by tank fire. A terrorist operating out of the Hamas-ruled Gaza Strip opened fire on IDF forces stationed along the Gaza border Monday morning, before being killed by Israeli tank fire. 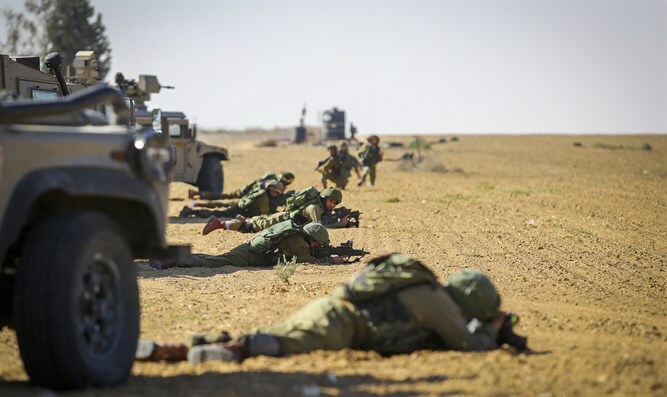 The incident occurred along the border of the northern Gaza Strip, an IDF spokesperson said Monday, when a single terrorist opened fire on an Israeli army unit. “IDF soldiers shot at a terrorist who had opened fire on them in the northern Gaza Strip,” the spokesperson said. A subsequent report said the terrorist had been eliminated after an IDF tank opened fire on his position. The attack comes as Israeli and Hamas negotiators continue their efforts to reach a framework for a ceasefire agreement. The talks, conducted by proxy through Egypt, are reportedly close to yielding a deal for a ceasefire, senior Hamas officials claim, despite opposition by the Palestinian Authority. PA leaders have criticized the talks, arguing that the PA must be included in any negotiations with Israel, and that a successful ceasefire cannot be brokered between Hamas and Israel without the full reestablishment of PA control over the Gaza Strip. “So long as there is no internal Palestinian reconciliation, under which total control of Gaza is returned to the Palestinian Authority, no ceasefire plan can be implemented in Gaza,” a senior PA official close to PA chief Mahmoud Abbas told Israel Hayom.